Boise State's Justinian Jessup brings the ball upcourt against Utah State Saturday, Feb. 23, 2019, at Taco Bell Arena in Boise, ID. USU won the game 78-71. Coaches are always looking for the right combination on the floor, and it’s never too late to find a new one. What Boise State found Saturday isn’t likely to be a long-term answer, though. BOISE, Idaho — Tuesday, February 26, 2019. Boise State coach Leon Rice did something different down the stretch in Saturday’s loss to Utah State. He went “small,” going without a center for the final 6½ minutes of the game. In fact, Rice didn’t substitute anyone for the rest of regulation after sending Derrick Alston in for Zach Haney. The lineup included Alston, Justinian Jessup, Alex Hobbs, Marcus Dickinson and Malek Harwell, and it was then that the Broncos rallied to take the lead with a 16-2 run. Why did Rice go that route? “We squeeze it and squeeze it and get no lemonade with some of the lineups we put out there,” he said. Could it be a trend? Maybe. But Rice’s choices are limited. Aside from that “final five,” he has the two inside guys who were sitting on the bench, Haney and David Wacker, and Pat Dembley and R.J. Williams, who have both struggled. In the same Learfield/IMG Sports postgame show Saturday, Rice said, “I’m really proud of this team. 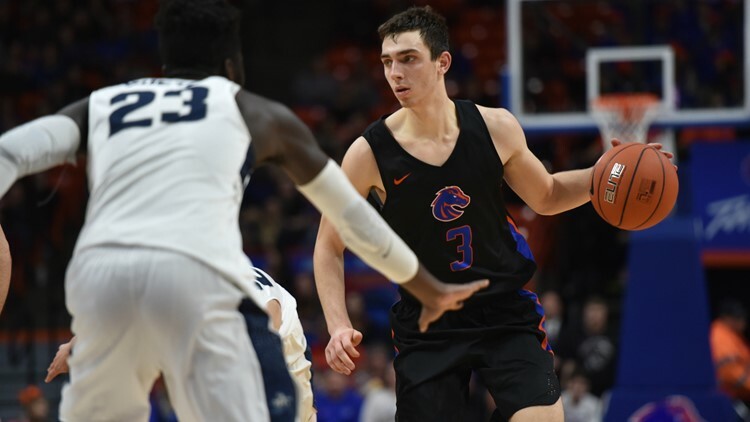 They’ve had a lot of heartbreaks, but they keep fighting.” One of the players representative of that was Jessup, who gave Boise State its first lead of the game on a jumper with 2:02 left. Jessup scored seven straight points and buried a three-pointer to give the Broncos a five-point advantage in the final minute. He had 21 points for the game. One observer pointed out that Jessup might not be Boise State’s Batman, but he’s a helluva Robin. (Derrick Alston may be Batman eventually—he scored 22). Nevada took the expected hit for its loss at San Diego State last week, falling out of the top 10 for the first time this season. After ranking sixth in both polls last week, the Wolf Pack dropped to No. 12 in AP and No. 13 on the Coaches list. Meanwhile, there’s some consolation this week for the ugliest of college basketball seasons in the West, as there’s now a second team in the rankings. Washington debuted at No. 25 in both polls Monday. Cool story by B.J. Rains in the Idaho Press about Leighton Vander Esch deepening his roots in Riggins. The former Boise State star and current Dallas linebacker recently paid more than $45,000 for a new weight room at Salmon River High School, and it’s already operating. “It was the first thing that popped into my mind because it was a big need,” Vander Esch told the Press. “It just made the most sense. A lot of the racks and stuff were all made in shop class and everybody has been saying we need a new weight room.” Rains also reports that Vander Esch negotiated new uniforms for the Salmon River football and basketball teams into his Nike apparel contract. Former Boise State running back Alexander Mattison checks in today with the rest of the running backs at the NFL Combine in Indianapolis. Mattison’s individual measurements, medical exams and many of his team interviews will take place tomorrow. Then the bench press is on tap Thursday, and on-field workouts Friday. The quarterbacks are slated to report tomorrow and go through the aforementioned activities a day later. But Rains (him again) reports that former Bronco Brett Rypien will arrive early, as he’s been chosen to serve as a throwing quarterback in drills for the running backs and the defensive players during the Combine. College of Idaho shoots for its fourth Cascade Conference title in six years tonight when it hosts Southern Oregon in Caldwell. It was an upset at the hands of the Raiders a week and a half ago that helped deny the Coyotes their initial shot at one of the Cascade’s two automatic berths in the NAIA Championships. C of I can secure the league’s other bid with a victory tonight and make a third straight trip to the nationals. At 27-5 on the season, the Yotes are no doubt in the national tournament as an at-large selection even with a loss, but they’re intent on getting it done the right way. Tonight’s tilt, by the way, will be televised on ROOT Sports. University of Idaho men’s basketball is limping along at 4-23 with a 13-game losing streak, enduring its worst season in 12 years (the Vandals went 8-52 over a two-season stretch from 2005-07). UI is in a pickle. It’s had some good seasons under Don Verlin. In fact, they topped 20 wins in two of the past three seasons. But there’s been a painful cause-and-effect in the stands at Cowan Spectrum. The fan count has always been a problem in hoops, but “pitiful” might not be a strong enough word for the Vandals’ attendance this season. They’re second-to-last in the Big Sky, averaging 683 fans per game. There were only 409 there for Idaho’s last home game, a 75-47 loss to Northern Colorado. The problem affects football. If there was any chance an FBS conference would ever give the university a look again, well, you know. Boise State women’s softball typically spends ther first six weeks or so of the season away from home. Therefore, this particular Bronco program flies under the radar early in the year. Boise State is off to its best start in school history with a 10-2 mark that includes wins over Boston College, Ole Miss and Michigan State. The defending Mountain West champions have a nine-game winning streak—their home opener is still 3½ weeks away. One more catchup item points to a good sign for Boise State men’s golf. Sophomore Skyler Eubank won the individual title at the 21-team Wyoming Desert Classic in Palm Desert, CA, by two strokes over the weekend. As a team, the Broncos finished just one shot behind the tournament winner, No. 18 Texas Tech. One of the longest and most productive NFL careers of any Treasure Valley native comes to an end, as Fruitland’s Jordan Gross announces his retirement from the Carolina Panthers. Gross, a left tackle, played all 11 of his NFL seasons with the Panthers and was selected to three Pro Bowls while starting a club-record 167 games. He was the No. 8 overall pick in the 2003 NFL Draft out of Utah and started in the Super Bowl as a rookie.